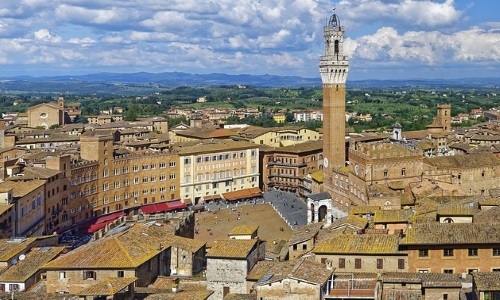 Siena, in the heart of Tuscany, is one of the most visited cities in the region along with Florence and Pisa. The old part of the city is outstanding, with great sights such as the gigantic Piazza del Campo and the world-famous Cathedral Siena. Once upon a time Siena was a very big and powerful city in Europe. Today it is a provincial town in central Italy with a population of 50,000. 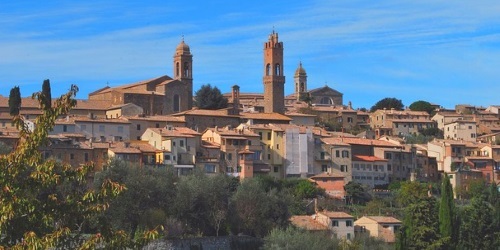 But the tourists come because of the former size of the city in the heart of Tuscany. There are also many sights and a wonderful landscape in the area. Picture: The famous Piazza de Campo with the palace Piazza Pubblico and its tower Torre del Mangia over 100 meters high. 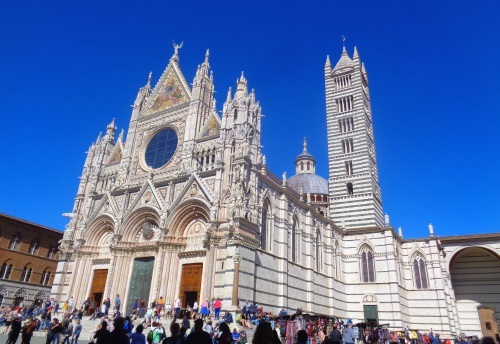 The Cathedral of Siena is one of the three world-famous churches in Tuscany, along with the Cathedral of Florence and the Cathedral of Pisa with the Leaning Tower. The church is the biggest monument in Siena. Although there are only side lines to Siena, the city is still easily accessible by train. From Florence there is a train connection to Siena about once an hour. From Pisa, Livorno and Lucca you usually have to change trains in Empoli from Florence to Siena. There is also a train to Grosseto by the sea in southern Tuscany about every 2 hours. Here you can change to the seaside resorts in the surrounding area or to Rome. Another train connection, also several times a day, goes to Chiusi, from Siena in south-east direction. Here you can also change trains, for example to Rome. There is a small airport 12 kilometres south of Siena. This airport is hardly used at the moment, but there are plans to extend it. There are also many regular buses from Siena to nearby cities and further afield (including Florence, Rome, etc.). Siena is inland in the center of Tuscany. The main sights in the centre are not far from each other and are best reached on foot.